Vietnam News Agency reporter spoke with the director of the General Statistics Office, Nguyễn Bích Lâm, about this issue. The prices of some public and strategic services are expected to increase this year, including health care and education services. What is the relationship between the consumer price index (CPI) and economic growth? Are you concerned about the low growth in the CPI in recent years? The CPI is an index that reflects fluctuations in the final retail price. High inflation does not necessarily lead to an increase in gross domestic product (GDP). For instance, in 2015, the reduction in prices for petrol and food as well as the small increases in prices for commodities controlled by the State led to lowered production costs, which in turn resulted in a low growth rate for the GDP and CPI. Low growth of the CPI is not worrisome as it is a good sign of local economic development and creates conditions for adopting positive monetary policies, promoting the development of production and business and assigning public service fees according to the market price. 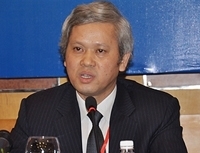 Lower inflation has allowed the Vietnamese đồng to retain its value, created stable interest in investment and business, limited goldenisation and dollarisation in the economy and promoted further economic development. In 2015, the government increased the prices of some strategic and public services but CPI still showed low growth. Will that situation continue this year? There was always cooperation between the related ministries and industries when the government increased the cost of those services. For instance, when increasing the price of electricity, the Ministry of Industry and Trade and the power generation industry held discussions with the Ministry of Planning and Investment, the Ministry of Finance, State Bank of Việt Nam and the GSO. The office plotted various scenarios connected with increasing the price of electricity to examine the impact of the increase on CPI and the GDP. The relevant ministries consider the increased price based on these scenarios and then submit their decision to the government for approval. This year, if the prices of those services are increased, the government will follow market trends and ensure general economic targets are not affected. Last year, the CPI still reflected a low growth rate despite increases in the prices of some public services, mainly due to the strong reduction in the prices of petrol and oil, leading to lower production costs and transport fees. In addition, with the higher supply of rice and foodstuff that make significant parts of the CPI calculation, these commodities contributed to last year’s low CPI growth rate. What are your thoughts on inflation this year? This year, Việt Nam expects to see GDP growth of 6.7 per cent and inflation held at under 5 per cent. I think it is highly likely that the ministries and relevant industries will increase the prices of health care and education services, bringing them closer to market rates. The increased prices will create problems for the people because they will have to spend more for these services, which will push the CPI up. The GSO expects that inflation this year will not see the same low growth rate as 2015 because the increase in prices for some public services and increases in salaries will raise the CPI. Therefore, we need forecasts on the advantages and disadvantages facing the domestic economy this year because the higher prices of these services will not stimulate supply and production. The increased prices could be a factor leading to reduced economic growth because increases in the cost of health care and education typically lead people to adjust their demand and spending habits, which affects the total demand in the economy. The government should continue to direct the ministries and relevant industries to ensure efficient cooperation in proposing policies related to inflation and economic growth. They should also continue cooperating in building potential scenarios for policies and appraising their impact on the economy.